May 10th marked one of the larger updates to happen to Puzzle and Dragons for NA/EU and I wish to cover all the relevant changes and evolutions. Monster Box Folders are one of the best quality of life improvements after the less than ideal changing how FAV sorting worked. Now through folders, you can better customize how your Monster Box works and is one of my favourite additions to date. Furthermore, several new evolutions have went live and I was able to actually play around with some of them which will help me provide a better opinion and analysis for them. You can read the official GungHo notes HERE. 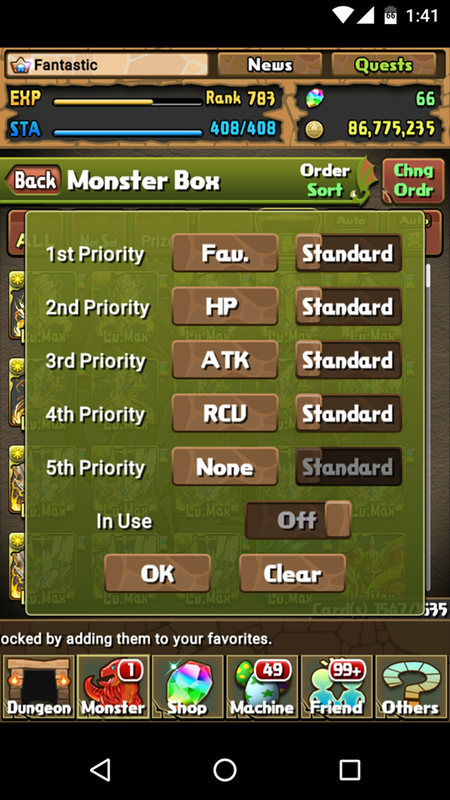 Monster Box Folders are one of the best things to happen to Puzzle and Dragons as it allows for amazing customization and organization. By default, all of your Evolution, Awakening, and Enhance materials are sorted into their respective folders leaving the remaining monsters in the Not Set tab. The following video is my quick tutorial on how I go about using the new Folders. What I love most about the Folders is that everything is organized to your liking and easier to view what you have. Another amazing feature of the Folders is that each tab memorizes the previous setting and personal Sort setting. This means you can have your Evolution materials sorted differently than your enhance materials. For example, you could have your Evolution materials sorted by Fav -> HP -> ATK -> RCV while enhance is done by EXP value. This will help sort the evolution materials by their respective group so you can quickly glance to see if you actually need to go out and play Wednesday Dungeon (I probably should). Reincarnated Kushinadahime is simply amazing and combines durability, ease of activation, perfect damage control, explosive output, and the ability to use Dragon Killer latent awakenings. 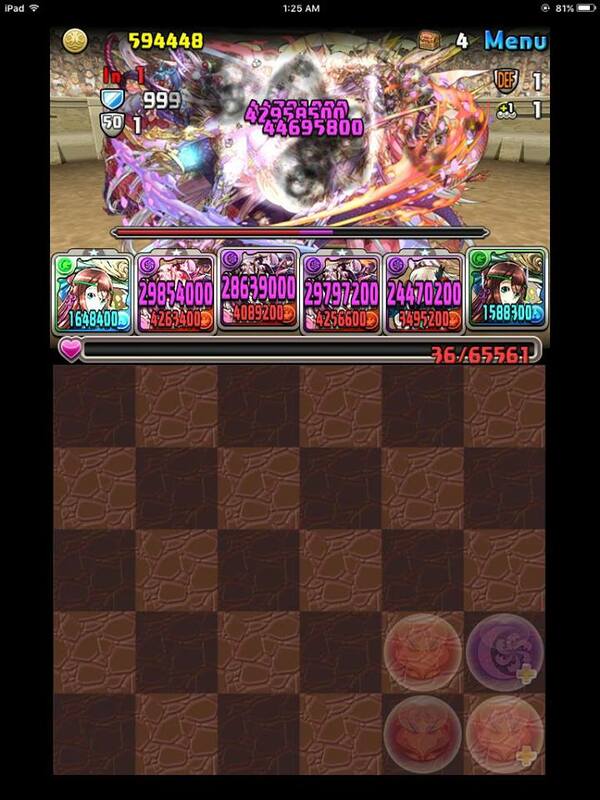 Furthermore, she can beautifully capitalize on 7 combo awakenings to further augment her damage. It comes as no surprise that Haku is a staple sub and further cements the notion that if a team can run 2-3 Hakus, it will be top tier. The 7 combo awakening and dual TPA help diversify your damage control potential when combined with the no Skyfall clause. 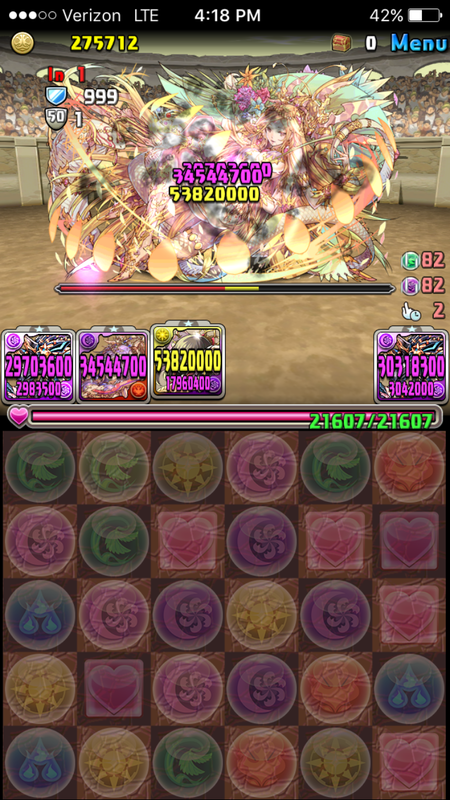 This is a fantastic scaling multiplier that is further augmented by a 2.25x HP to Healers. This helps combine durability as well as naturally high RCV that helps you dance around troublesome encounters. 7 combos with a dark TPA will mow through most content (also remember the 7c awakening for 2x more damage). Despite the no Skyfall clause, it is almost always possible to hit 7 combos on a given board so you should be able to pump out consistent damage. However, Kushinadahime is not without limitations. Most notably, she is a purely skill based leader who will take adjustment to using efficiently as you can no longer rely on Skillfalls or RNGesus to save you. Furthermore, her ability to efficiently stall is marred by her rapidly scaling leader skill. In order to heal efficiently, you will need to achieve a high combo count which will inevitably deal large amounts of damage. As such, I treat her stalling like Dark Athena , tank what hits you can while hoarding heart orbs and then burst through while healing up. 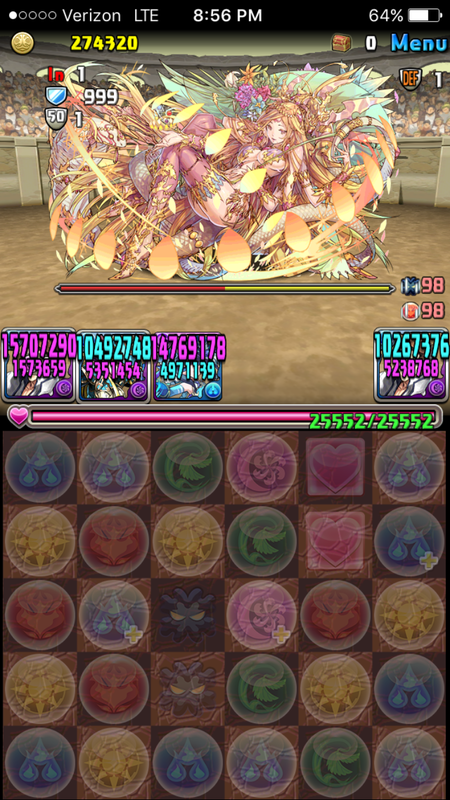 I have had several Arena 3 clears with Kushinadahime and like Dark Athena, she can easily handle Hephaestus Dragon. Above is 9 combos with two TPA while the bottom picture is 10 combos with 0 TPA. Either way, the damage output is incredible. Reincarnated Pandora outside of her cute artwork. 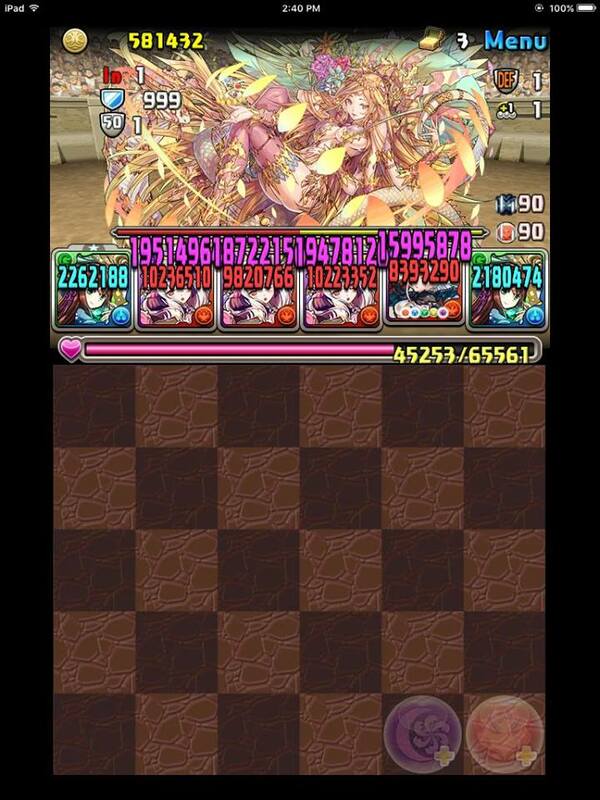 She was once a top tier leader, but GungHo has gave her an underwhelming evolution that does not really keep abreast with older tank teams like Krishna as she is orb hungry with lower defensive multipliers. Perhaps this is a “good” thing as the meta is shifting away from row teams and more towards combo-oriented ones. However, many people will have a certain degree of nostalgia/fondness for Pandora that they may be disappointing. 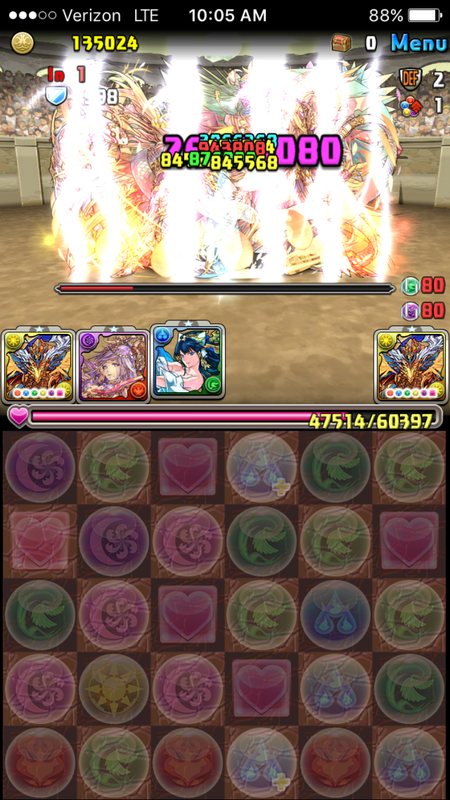 Regardless, I did take her for a spin in Arena 1 and I was shocked that a single row could not even kill most floors. Ame no Uzume tends to be an overlooked card mostly because she has an underwhelming active skill and could not feasibly fit on most meta teams. Her new Reincarnated evolution is certainly an upgrade as it provides meaningful awakenings that help her pump out more consistent damage. However, the main focus will be on her leadership potential as she now has the potential to achieve 2.25x HP and 81x ATK for Physical and Devil types when matching Fire, Wood, and Light orbs. Naturally, this will help create a tanky team and the recovery component is somewhat offset by the bonus RCV from the leader skill. I do sometimes question the logic of having 7 combo awakenings with rows as it is challenging to achieve both at the same time, but it also grants you flexibility when dealing damage. You can elect to purely combo and if you do have subs with the 7 combo awakening, you will be dealing respectable damage on 81x. In addition, you could also use the rows when faced with an awkward board and still produce meaningful damage. Finally, with full board changers, you should be able to utilize both awakenings. However, the main fault I find in Reincarnated Ame no Uzume teams is the naturally low RCV for her team. Yes you can use her active skill to offset this, but that means you will be having 1-2 active slots completely wasted and this will prove problematic in challenging content. Ars Nova and Goetia have historically been underwhelming cards, but their new evolutions do provide additional value. Their active skills randomly spawn 5 orbs of their primary colour at random while simultaneously enhancing them. This is great for mono colour teams along with their numerous enhanced orb awakenings. However, this new evolution grants them an improved leader skill that bolsters them to an unconditional 49x ATK if cards share their two elements. Thus, Ars Nova boosts light and fire cards while Goetia utilizes dark and wood types. While 49x may not feel spectacular, it is unconditional and will make for easy and mindless farming. Challenge mode has been revamped to use your leader, two subs, and a friend for the chance at unlocking an additional Magic Stone. This ensures you retain your full multiplier, but will have to be creative when selecting subs to support your team. Not only will two subs lower your overall damage output, but you will have lower HP, RCV, SBR levels, and fewer active skills. I feel this is a fun and exciting as this will help keep the feel for your favourite team intact, but present a unique and challenging twist. With the Challenge Mode Renewal, there are countless Magic Stones to be acquired as you are able to replay all of the Normal and Technical dungeons again for a first time clear. Due to the fact that you have to grind through hundreds of floors, you will probably want to find the fastest route possible. As such, I recommend using Hino as a leader for his large damaging follow up attack after matching 1 combo. This means you will only need to match 1 combo of any element to trigger about 200,000 damage with dual leaders. To make this go even faster, try to use only fire cards and no other elements to cut down on animation times. However, if you require a little more damage, you should use a fire/dark card to trigger his 9x ATK multiplier. You should use this opportunity to farm for Pal Points for the upcoming GH PEM renewal. The infamous GungHo Pal Egg Machine returns on Friday, May 12th with a wonderfully revamped +15 per pull. That means 500 pal points = 15 Plus Eggs. This is incredible and must be abused and taken advantage of as there is simply no better avenue for acquiring Plus Eggs. If you have ample Best Friends, it is advisable to use each of them every day during this event. For 2 stamina, you can enter the lowest difficulty Normal Dungeons and quit (or play through for Challenge Mode) and repeat until you exhaust your list. This will translate into 10 stamina for 15 plus eggs. For comparison, Star Den is 25 stamina for 10 pluses. Version 11.0 is one of the most exciting updates to date as the Monster Box Folders are simply amazing. The new evolutions help revitalize older cards and we have plenty more to look forward to in the upcoming weeks. Let me know which of these features you are most excited about. I’m lack of playing Combo team, just want to know the gameplay mindset should be Combo first or TPA first? Always combo first. TPA is a bonus. but am still working on the leveling. The Gung Ho PEM renewal comes at a great time. I had so many cards that I didnt use that were suddenly top tier and needed +ing. So i have been hoarding my pal points and now Dark Athena, 2nd Haku, 3rd Haku, Loki, Kush, Ariel and Allura are all either +297 or close. Its kinda refreshing that I am almost done with ‘earmarking’ + eggs for cards as almost all of my routinely used cards are now maxed. For once i might be able to stockpile + eggs and immediately +297 the next time i get a great card. As far as the Challenge mode reset, I am always happy to get more stones! I’m sure most people will think of this, but keep an eye on the normal dungeons as they cycle through ever 8(?) hours with several dungeons being 1/2 stamina. So it is much cheaper to jump around doing what is 1/2 stamina then plodding your way through from easiest to hardest. The best thing about the update is folders and makes it easier to shift through and view the content. Regarding Kush, I don’t think it can be understated how average she is unless you have the skill to combo consistently. You sir are at another level and make me want to whale for her in the upcoming godfest. Alas, My average combo count is at the 5 range, getting to the 6 range. By the time I can consistently achieve 7 combos there will probably be a new meta. You skipped the Daily Dungeon changes, which are a great quality-of-life improvement (unless you happen to need RGB demon masks, that is). One thing I’d like to add, is that RevoAme is finally a card, that can make good use of Yang Gufei, as she fills the wood slot, has 2 SBR and a true damage active! Also RevoKushi is totally busted. I didn’t try Arena3 so far, but beat it on the first go with her 😀 still miss her bunny ears but as long as my main waifu finally gets the spotlight, I won’t complain! Kush is silly strong. 7 combos is far too much damage when you throw in TPA and 7c awakenings. Everything else is great but I am soooo sad about Pandora. I wonder if maybe they will buff later. Here’s hoping! Nessa sugestão que trouxemos foram utilizadas duas placas de madeira rústica e fitas para pendurá-las. hints for people who wants to improve own composing talents? due to the fact modern students must write a big amount of numerous papers for college and universities. on a trusted penning organization.